T‌his page lists the residencesancarlo.com website's management methods‚ with particular reference to the processing of the personal data of users who visit the website. This report is issued according to Article. 13 of Legislative Decree No. 196/2003 –Code on personal data protection – and Article 13 of GDPR 679/2016 – European Regulation on privacy – regarding individuals who visit the residencesancarlo.com website‚ or who use the website’s services. 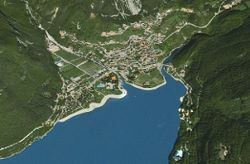 This report is provided exclusively for the residencesancarlo.com website and not for any other website that may be visited by the user via the links on this website. T‌he data controller is Residence San Carlo S.n.c.‚ based in I - 38018 Molveno Via Lungolago, 2. D‌uring normal operation‚ some IT systems and software procedures acquire personal data for the operation of residencesancarlo.com‚ the transmission of which is implicit in the use of Internet communication protocols. T‌he recording of personal data‚ as well as sensitive data‚ on website pages specifically intended for service requests‚ access to restricted website areas‚ signing up to the newsletter‚ and the voluntary and explicit sending of emails to the addresses indicated on residencesancarlo.com‚ involves the subsequent acquisition of data necessary for processing requests‚ as well as any other personal data that is entered. Data processing will be carried out by members of Residence San Carlo S.n.c.‚ the persons in charge of the sales department‚ our administration employees or our technical employees‚ in line with their various areas of competence. T‌his type of cookie allows users to be profiled so that we can offer targeted advertisements based on the user’s preferences during navigation. residencesancarlo.com does not use first-party profiling cookies‚ but may use third-party profiling cookies‚ which are detailed below. T‌he site uses Google Analytics‚ a web analytics service provided by Google Inc. (hereinafter referred to as "Google") which installs persistent (third-party) cookies on residencesancarlo.com.